A strong colt with tremendous presence. He has dealt with stable life very well and while he is a little boisterous at times he is genuine in his work and shows talent. So You Think is the leading third season sire and this fellow looks like adding to that record. He is due back into the stables in June for a preparation aimed at the Spring Carnival. 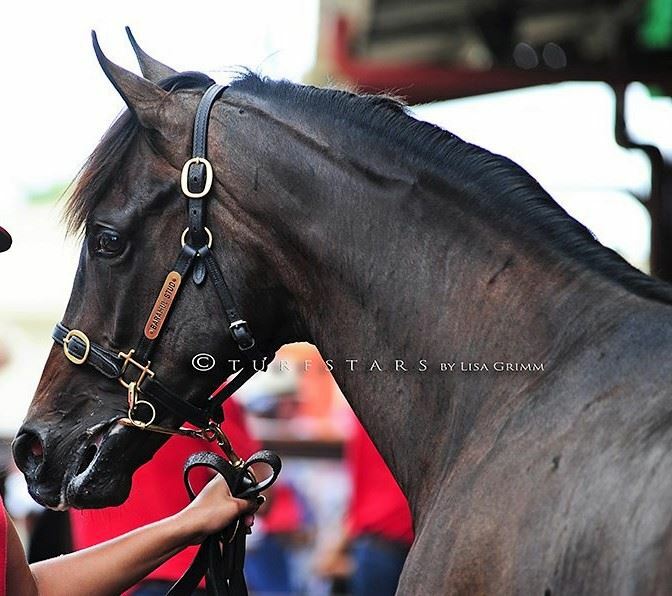 SO YOU THINK (NZ) (Bay or Brown 2006-Stud 2012). 14 wins-1 at 2, MVRC WS Cox P., Gr.1-twice. Sire of 300 rnrs, 170 wnrs, 13 SW, inc. La Bella Diosa (New Zealand One Thousand Guineas, Gr.1), Sopressa, D'Argento, Inference, Gold Rush, Heavenly Thought, Higher Ground, Think Bleue, The Pinnacle, Northwest Passage, Global Thinking, Marathon Man, Care to Think, SP Harvestfortheworld, Coral Coast, Mr So and So, Neguev, I Thought So, Kaching, etc. FIRST COMMAND (g by Commands) 12 wins to 1200m, NZ$175,000, A$836,601, MRC Caulfield Sprint H., Gr.2, Heath S., L, LT Cleary S., L, VRC Kensington S., L-twice, MRC Mal Seccull H., Geoff Murphy H., Rokk Ebony H., MVRC Marsh Pty Ltd H., MRC Waratah H., 2d WRC Telegraph H., Gr.1, VRC Gilgai S., Gr.2, MRC Rubiton S., Gr.3, SAJC RN Irwin S., Gr.3, BRC Lightning H., L, MRC Testa Rossa S., L, 3d MRC Rubiton S., Gr.2, WJ Adams S., L, Doveton S., L, VRC Swisse Vitamins Century S., L, 4th MRC Oakleigh P., Gr.1, Kevin Heffernan S., L.
ONEWORLD (c by Danehill Dancer (Ire)) 8 wins-1 at 2-at 1200m, 1400m, HK$13,129,350, 736,000Dhs, HKJC Cathay Pacific Jockey Club Sprint, Gr.2, Audemars Piguet Dream H., Cheung Fat H., Chow Tai Fook Aura Series H., Anna Sui Flight of Fancy H., Flamingo H., Billion Win H., Yan Chau Tong P., 2d Cathay Pacific Hong Kong Sprint, Gr.1, HKJC Premier Cup, L, Sha Tin Sprint Trophy, L, Premier Bowl H., L, Super Fit H., Panasonic Joba H., To Kwa Wan P., 3d Meydan Dubai Golden Shaheen S., Gr.1, HKJC Kent & Curwen Centenary Sprint Cup, L, Sprint Cup, L, Sha Tin Vase, L, Chow Tai Fook Bauhinia Sprint H., L, Sha Tin Raceourse Anniversary Cup, London H., 4th HKJC Queen's Silver Jubilee Cup, L, Chairman's Sprint Prize, L, Sprint Cup, L, Sha Tin Vase, L. Sire. Rule the River (f by Commands) 5 wins to 1200m, A$234,080, ATC De Bortoli Wines H., McGrath Estate Agents H., Farewells Alan Thomas H., Tab.com.au H., 2d ATC Drummond Golf H., 3d City Tatt's RC Nivison S., Gr.3, Gosford RC Takeover Target S., L.
Twilight Song (f by Fastnet Rock) 2 wins at 1100m, 1200m in 2017-18, MRC Spicer Thoroughbreds H., Ladbrokes Cash in P., 3d VRC Incognitus S., L.
Cao Cao (g Fastnet Rock) 2 wins-1 at 2-at 1000m, 1400m, A$174,150, to 2017-18, MVRC Whiteman Property 2YO P., MRC Ladbrokes Info Hub H., 2d VRC Maribyrnong P., Gr.3, 3d VRC Members Pavilion H., 4th Bendigo Guineas, L.
Red is the Rose (f by Fastnet Rock) 3 wins to 1500m, A$97,560, to 2017-18, MRC Elaren Security Services P., MVRC Ranvet H., 3d Mornington Guineas, MRC Moorookyle Park Thoroughbreds P., 4th VRC AV Kewney S., Gr.2. Riviere (f by Redoute's Choice) 3 wins at 1200m, A$75,808, MRC Sportingbet H., MRC (Mornington) Gripple Hang-Fast H., 2d MRC City Of Glen Eira H.
Crooner (g by Encosta de Lago) 5 wins at 1000m, 1100m in Aust. Moonlight Waltz (f by Fastnet Rock) Winner at 900m in 2016-17 in Aust. HEADWATER (c Exceed and Excel) 3 wins-2 at 2-at 1000m, 1100m, A$460,800, ATC Silver Slipper S., Gr.2, VRC Kensington S., L, MRC Cactus Imaging 2YO P., 3d ATC Todman S., Gr.2, 4th MVRC AJ Moir S., Gr.1. KULGRINDA (f Exceed and Excel) 9 wins to 1100m, A$553,684, SAJC RN Irwin S., Gr.3, MRC Carlyon S., L, SAJC Lightning S., L, Manihi Classic, L, MVRC City Jeep H., Essendon Mazda 55 Second Challenge Heat H.-3 times, 2d SAJC DC McKay S., Gr.3, MRC WJ Adams H., L, SAJC Redelva S., L. Producer. RIVER DELTA (f Al Maher) 4 wins at 1200m, 1400m, A$248,210, Geelong RC Black Pearl Classic, L, MRC Geoff Murphy H., VRC Prudential P., 3d MRC Sportscover Insures VAFA P.
CROSS CURRENT (g Keltrice) 3 wins-1 at 2-to 1400m, A$293,000, MRC JRA Doveton S., L, VRC PFD Food Services S., L, Today Tonight 2YO Sprint H., 2d MRC HDF McNeil S., Gr.3, MVRC Leslie Froggatt S., L, Mitchell McKenzie S., L, 3d MRC Merson Cooper S., L.
WILLOW CREEK (f Tale of the Cat) 2 wins at 2, A$250,475, STC Magic Night S., Gr.2, 2d VRC Sires' Produce S., Gr.2, 3d SAJC Adelaide Guineas, L, VRC Talindert S., L, 4th MRC Blue Diamond S., Gr.1. Producer.